Irons are designed for accuracy, not distance. Hitting a solid golf shot with an iron requires balance, tempo, acceleration and precision. There are almost as many tips to hitting a great iron shot as there are players and teachers, but the simplest goal will often yield the best result—that is, hitting the ball crisply in the center of the clubface. Keep a few simple thoughts in mind and you should be able to deliver the face of your iron club squarely to the back of your golf ball. Have a smooth takeaway. One of the most often-heard tips on the range or course might seem to suggest swinging slowly. In actuality, that is not really the best goal. Slow clubhead speed will deliver short distance and inconsistent shots. Smooth is really the goal you should have in mind, particularly in the transition of your backswing and downswing. When you move quickly in this section of your swing, you can throw off your alignment, which makes hitting the ball consistently very difficult. Concentrating on a smooth takeaway from the ball at address will allow you to accelerate throughout your swing and deliver the club precisely to the back of the ball. Unwind from your feet. Too many players swing from the top of their swings with their hands. This throws off all of your geometry and allows all the power you've stored in your back swing to leak out before you reach the ball. What you should feel is an unwinding feeling from your feet and legs. This helps you meet three very important goals that launch the ball on straight, driving trajectory: maintain balance; accelerate through the golf ball; and generate power through the swing. Anchor your head. "Keep your head down" is one of the oldest tips in the game. But the tip is not really so much about keeping your head down as it is about keeping your head still. Your golf swing rotates around an axis with your head, or eyes, as the center. Your swing bottoms out and hits the ground exactly where your head is. The tendency is to slide forward on your downswing. If you keep your head still and even with or even slightly behind the ball, you'll strike the ball cleanly. Keep a straight front arm. Another classic and long-held tip is to keep your left arm (or right arm for left-handers) straight. The biggest impact this has is to keep the length of your lever—your arm and swinging club, that is—a consistent length throughout the swing. If your front elbow bends during your swing, you are changing the distance your clubhead is from the ball, giving you one more thing to adjust before impact. Strike the ball first. The most important factor in hitting a good iron shot shows up exactly at the moment of impact. 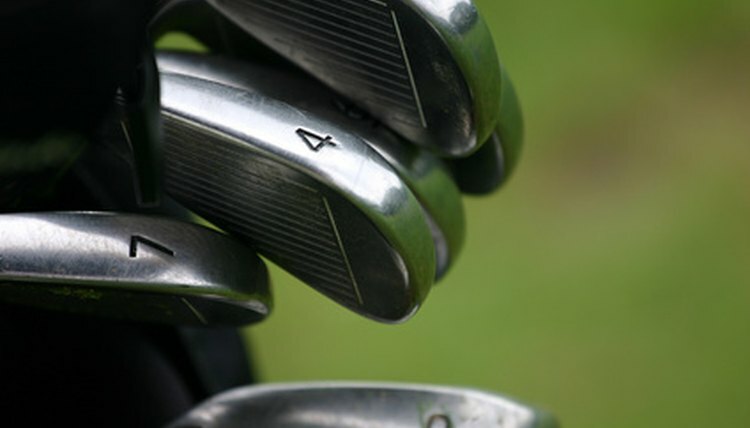 Your club should strike the ball slightly before it strikes the ground and begins to take a divot. While you can and even should hit your driver on the upswing, you absolutely must hit your irons with a descending blow to impart an accelerating, driving trajectory. Follow through along the target line. As you finish your swing after your club has struck the ball, make sure your club follows a straight path along your target line for as long as possible. You can test this by looking at your divot after you've hit your shot. It should be pointing directly at your target.